Excellent presentation and great music. Great tune and nice sync! this is fantastic all around! Excellent synchronization with the music and awesome code. I was thinking about ways to do this for so long, and haven't got a clue how you pulled this one off!! Great prod!! Great music!! Great sync!! I love it!! MORE PLZ!! This not only won the checkerboard challenge but is also a very nice demo in its own right. But that's the smug answer, it's not clear-cut. It shows 13 in the deepest parts. But depending on effect not all of the time because of number of sprites limit (see the parts demonstrating layer independence). Wahou, impressive, and that music !!! Really really cool, redefining the concept of audio/visual synch! Great presentation, great music, great amount of checkerboards. The music and sync in this attempt is the best! Outch! Ace in every aspect! It's not just the tech, it's also the presentation. Watch and learn. This has the flow and the music! Smooth effect and great tune. The sync is brilliant! Impressive, and I would have guessed more than 13 layers. I would also have guessed AGA. Very cool effect and nicely tuned to the music! tight sync and lots of layers - blueberry lived up to expectations! Having now watched all the checkerboard entries, I want to re-emphasize just how much this stands above the rest. It's smooth, it flows brilliantly and unlike some of the other entries, it's not cheating - it's just a fuckton of planes with proper flight paths, fast zooming and great colors. absolutely masterful on all fronts! Hits all the marks. Nicely done. This is how you make a one-trick pony jump! Yuppp ... The step-by-step guide on how to present one effect ... Good work, guys! Complete mastery of the domain and a very enjoyable soundtrack. I wouldn't know how to improve what I've seen. This Is f*cking brilliant! Excellent effect, sync & presentation and you gotta love that tune! Awesome execution, great tune, great sync! Masterpiece! Nice intro! Music in 'Mantronix&Tip/Lizarking' style which I love personally. Since i just read the post about the effect itself.. you made a real production out of it.. cool stuff.. I do not usually give thumbs up for intros with one effect, but the music, style/sync + technical achievement gives it a big thumb up. rulez added on the 2018-02-06 00:08:06 by JAC! Great tune, nice visuals, easy thumb! Awesome tune. Very enjoyable to watch, much because of the sync. lovely music and smooth like butter. good one!! And what DanLemon said. Pretty please! Splendid! Music sounds sooo clear! Awesome work from Blueberry aswell. I forgot the thumb in last post..
Sure. The effect indeed runs in dual playfield mode, displaying two 6-layer checkerboard effects on top of each other, using 3 bitplanes each. The occasional 13th layer consists of sprites. In the following, I will describe how to cram 6 layers into 3 bitplanes (using less than half a frame of time with 6 bitplanes of DMA load). 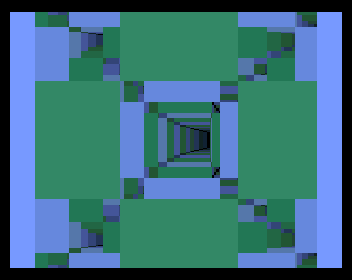 As a precalculation, I generate bitmaps describing what the rows and columns of a checkerboard layer look like for each depth. The demo uses 512 different depths, and for each depth there is a 1024-pixel row and a 512-pixel column. A checkerboard layer is conceptually a (suitably shifted and cropped) per-pixel xor between a row from the row map and the corresponding column from the column map. As you can see, only the lower 8 bits of each 16-bit word in the column map are used. I will get back to why that is. 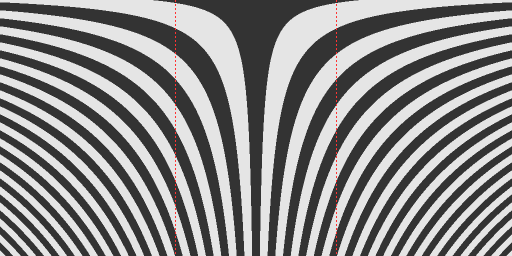 For each layer, a suitable section of a row in the row map is extracted, using the blitter. The row is chosen based on the depth of the layer, and the section to extract within that row is based on the X offset of the layer. Similarly, the depth also selects a column from the column map, and the Y offset of the layer speficies which bit in that column corresponds to which scanline of the display. 1. 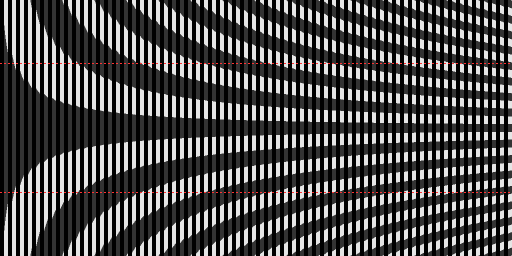 For each of the 64 combinations, produce a 3 bitplanes deep scanline corresponding to that combination by logically combining the extracted sections using the blitter. 2. At each scanline of the display, using the copper, set the bitplane pointers to point to the appropriate combination. The block on the top shows all 64 combinations of bit values from the layer sections along the horizontal axis. Colored means 1 (opaque), black means 0 (transparent). The next block shows the computed logical combinations of the layers. The first two rows (T1 and T2) are temprary values needed in the computation, and the last three (P3, P2 and P1) are the resulting bitplane contents. The formulas for each row are written to the right. Note that each formula has at most 3 inputs, which means it can be computed using the blitter. 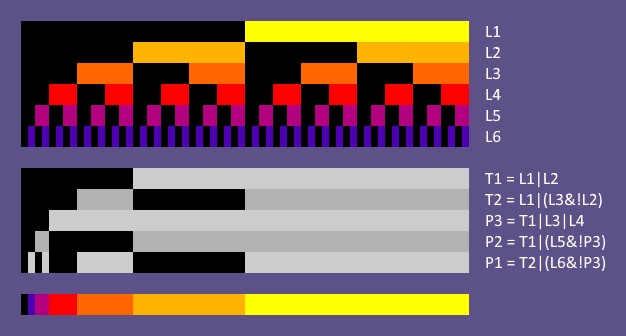 The bottom block shows the resulting color (as indexed by the bit values in the 3 bitplanes). Each layer has its own entry in the palette, except for layer 5, which occupies both color 2 and color 3. The resulting color corresponds to the front-most layer, as desired. With these formulas, bitplane 3 only depends on the first 4 layers, so only 16 combinations need to be computed. Bitplanes 2 and 1 each depend on 5 layers, so they need 32 combinations each. Some of the blits can be combined to save a bit of overhead. Instead of 4+8+16+32+32 = 92 blits, it is done using 4+8+4+8+4 = 28 blits. Furthermore, the front 6 and back 6 layers can share the same blits (with twice the width). Where the states of layers 1-6 are denoted by A-F, and the x's are an offset into the scanline (different for the front 6 and back 6 layers). Each blitted column must be extracted from the column map (all other bits in the word masked out), shifted from its bit position in the column map to its designated destination bit in the bitplane pointer, and then combined with the other columns. Since the columns are placed at bit positions 0-7 of each word in the column map and must end up at bit positions 7-11 in the bitplane pointer, the shift is always to the left (0 to 11 places), so the extraction blits always use descending mode. First, layers 1-4 are combined in pairs into a temporary space, and then the pairs are combined with the fixed bits into the bitplane 3 pointers. In the pairwise combination blits, the columns are sourced on A and B, so they can be independently shifted (which is possible since the shifts are always in the same direction). The A channel is masked by the first word mask, and the B channel is masked by constant data on the C channel. Bitplanes 2 and 1 are each a combination of bitplane 3, another layer (masked and shifted), and constant data. So that is how the effect works. To script it, I include a huge (but very compressible) block of explicit scripting data, specifying, for each frame, how many layers are shown, and the position, depth and color of each layer. Where possible, I store the values as deltas from the previous frame. The script is generated by a Lua program, using a custom tool. The writeup needs another thumb up! DAMN! I laughed when I read the 13th layer was sprites. Excellent work, and excellent write-up! That's some crazy use of boolean logic! And very good presentation too. This is one of those few cases that really got me wondering "how on earth did they do it?" Also, thanks for the technical write-up. I appreciate that very much. Superb! Amazing tech and presentation - and an excellent write-up. Truly interesting and inspiring! Awesome music which matches the effects perfect. Congratulations for this great little jewel. Demos should be like this and demosceners should be like blueberry (when sober). Perfect tune, synchro, everything. Hats off! The music is exactly what this effect needs, fits perfectly! Applause for the best checkerboard-zoomer ever, atleast on our Amiga! rulez added on the 2018-02-16 19:12:07 by ɧ4ɾɗվ. I don't understand the technical aspects of this, but despite it "only" being some checkerboards I find this strangely pleasing to watch! The music is magical and the concept is brilliantly executed. An awful lot of thought went into the synchronisation and the production of this masterpiece. wow! nice sync, worldrecord, awesome tune. Short but sweet. I like the music. Best checkerboard presentation with nice sync and superb music. I enjoyed it ! Forgotten thumb for this awesomeness ;) Deliciuos effects, perfect synchro and nice soundtrack. How in the bloody hell did I miss thumbing this up up up. The write-up alone is worth ten times a thumb. page created in 0.025165 seconds with 15 queries.